Musical Ecologies continues Thursday October 9th with composer and accordionist Guy Klucevsek. Known internationally as one of the most highly-respected and versatile accordionists, Klucevsek will perform a program of solo accordion music he has composed for a variety of dance, theatre, audio and video collaborations. Spanning the past twenty-five years of his career, the evening will include Altered Landscapes composed for choreographer David Dorfman, Inside Score to a video by Victoria Marks, Accordion Misdemeanors composed for the Audio Book of E. Annie Proulx’s novel Accordion Crimes, The Heart of the Andes composed for a theater piece by master puppeteer Dan Hurlin, and a suite of pieces from The Attic for choreographer Karen Bamonte. A major contributor to the accordion renaissance of the last 25 years his music reverberates with sounds of the ballroom, the beer garden and the concert hall, fusing elements of regional accordion styles with jazz and avant-garde music. The evening will begin with a conversation with series host Dan Joseph and the audience and a reception will follow the performance. Guy Klucevsek is one of the world’s most versatile and highly-respected accordionists. He has performed and/or recorded with Laurie Anderson, Bang On a Can, Brave Combo, Anthony Braxton, Anthony Coleman, Dave Douglas, Bill Frisell, Rahim al Haj, Robin Holcomb, Kepa Junkera, the Kronos Quartet, Natalie Merchant, Present Music, Relâche, Zeitgeist, and John Zorn. 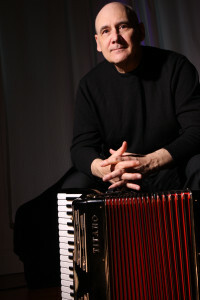 He has premiered over 50 solo accordion pieces, including his own, as well as those he has commissioned from Mary Ellen Childs, William Duckworth, Fred Frith, Aaron Jay Kernis, Jerome Kitzke, Stephen Montague, Somei Satoh, Lois V Vierk, and John Zorn.Performances include the Ten Days on the Island Festival (Tasmania), the Adelaide Festival (Australia), the Berlin Jazz Festival, Lincoln Center, Spoleto Festival/USA, BAM Next Wave Festival, Cotati Accordion Festival, San Antonio International Accordion Festival, Vienna International Accordion Festival, and the children’s television show “Mr. Rogers’ Neighborhood.” Klucevsek has released over 20 recordings as soloist/leader on Tzadik, Winter & Winter, innova, Starkland, Review, Intuition, CRI, and XI. In 2010 he received a prestigious United States Artists Collins Fellowship, an unrestricted $50,000 award given annually to "America's finest artists." Post a comment — Trackbacks closed RSS 2.0 feed for these comments This entry (permalink) was posted on Saturday, September 20, 2014, at 10:26 am by Dan Joseph. Filed in press release.